In 1961, a young boy out on a picnic with his family in the jungle, got kidnapped by a tribe of Indians. His father spent 11 years searching, before finding him again, only to be told by his grown up son that he would not leave his tribe. This is the true story that inspired the Emerald Forest; a magnificent tale of wilderness in nature, as within men. 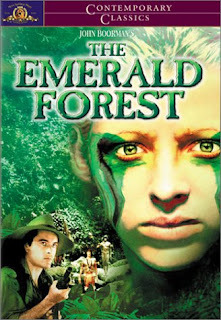 Powers Boothe, who had experience from trekking through thick undergrowth and swamps in Southern Comfort, delivers a solid performance as always, but instead of the gray-brown somberness of Southern Comfort, the Emerald Forest is a very lush and green movie, where the jungle really is the main character, as the title implies. Having seen the film many times, I always felt scenes where natives experience drug-induced astral projection and are able to talk to animals, to be the true core of the film, symbolizing the tribes-people's connection with nature, which civilized industrialism has all but forgotten.